Emerald waters, breathtaking landscapes, lavish greenery and pure air define the beauty of these 99 islands in the Andaman Sea. 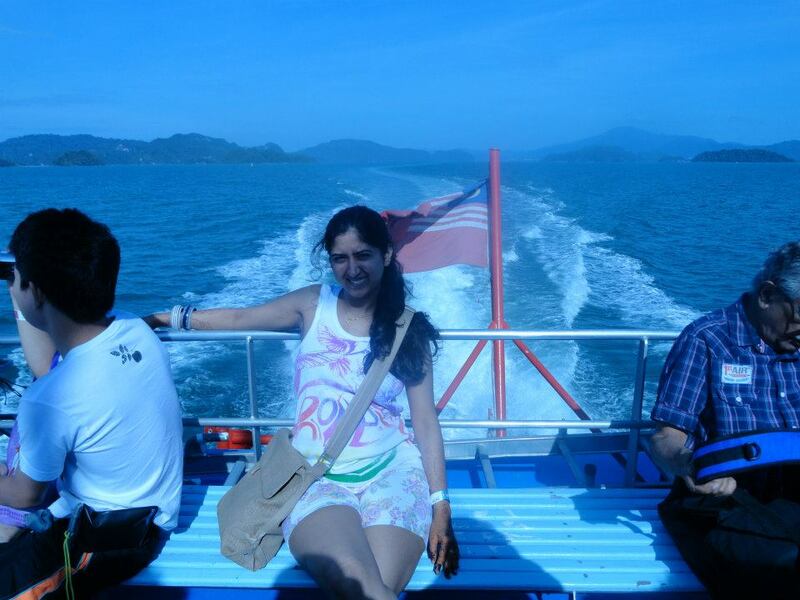 Langkawi, also known as the jewel of Kedah, is a land of clean beautiful beaches, rainforests, mountains and wildlife. I and my husband wanted to plan our first trip outside India to a beach destination in Asia. Considering various options such as Mauritius, Seychelles islands, Maldives, Thailand and Malaysia, we chose Langkawi in Malaysia as it was friendly on our pocket and not too far. I was apprehensive initially, as none of my friends had visited this place earlier. The good reviews on the internet did bring some solace to the soul, but firsthand experience was yet to come. We took a flight to KualaLampur and another connecting flight to Langkawi. When the flight was about to land, I noticed down the window, vast expanse of bluish waters with big and small pockets of green land spread in sparsely and all my doubts vanished. The Langkawi airport is small and noisy but it seems homely. As we got down, various travel agents surrounded us with their travel packages, day tours and handed us free maps of the popular tourist spots. We collected a local sim-card from one of the counters on the airport to keep in touch with our family back home. These local sim-cards fit into any GSM phone and calling rates are cheaper than pay phones. The moist breeze caressed my cheeks as our taxi meandered through the winding roads of Langkawi Island. People here are friendly and love to communicate with the tourists. Our taxi driver told us various folk tales of the city on our way to the resort. A popular legend says that there were two giants, Mat Cincang and Mat Raya, who became the current day mountains of Langkawi. Mat Raya was celebrating the engagement of his daughter to Mat Cincang’s son. Unfortunately, the groom was caught flirting with another woman at the feast, which resulted in a family feud. The present day islands, villages and mountains came to being after the fight. ‘Tanjung Cincin’ (means the place where the Ring was flung), the village of ‘Belange Pecah’ (means broken crockery), ’Kuah’ (means the split gravy), Kisap (means ‘seep in’ where the gravy seeped through the land and the Hot Springs emerged). The two giants became mountains of stone, Mat Cincang and Mat Raya, and Mat Sawar who was a mediator in the flight was transformed into the hill which now separates the two mountains. The Stay - We had booked a standard cottage in Berjaya Beach Resort, and I must say we were not disappointed. The staff was courteous and to our delight, they upgraded our standard cottage to a rainforest chalet at no additional cost. Tall dark rainforest tress, sound of the sea waves combined with the sound of screeching monkeys and fireflies and a secluded cottage with a rustic Malay architecture is romantic enough to bring you close to your partner. The entire landscape in the resort is designed to bring sufficient privacy for a couple. Each cottage has all the modern amenities, such as a phone, minibar, air conditioner, hair dryer, room service etc. The resort has a common dining area, multiple restaurants and lounges to suit enough cuisines, swimming pools, bars and a private beach. The Beaches – We spent the first two days visiting a world class collection of spectacular beaches; filled with glistening, white sands to unwind and relax on, as well as bright green waters full of marine wildlife to swim with. The liveliest of these being Pantai Cenang (best known as the Cenang Beach) and Pantai Kok. 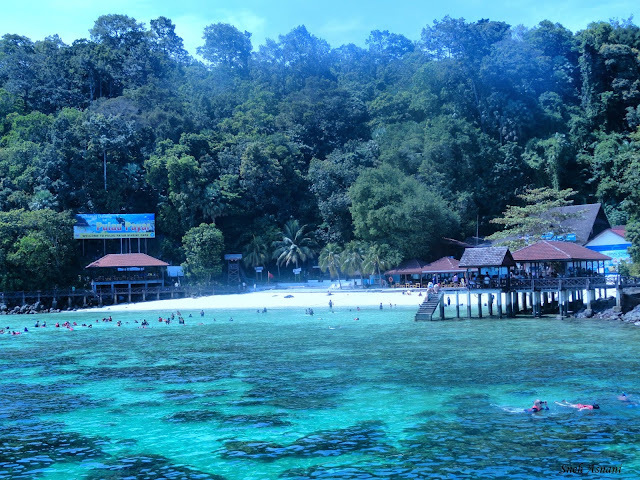 The Cenang beach is bustling with backpackers, restaurants and bars along the lengthy stretch. There are tour operators which will crowd you with pamphlets of sunset cruises, water sports, spa massages on offer. The Jet Ski ride is a must try on this beach. As we traveled west from the Cenang beach, we reached a more secluded and serene beach, Pantai Kok. The sand is almost white with the vast expanse of the Andaman Sea and a few more islands in the background. It looks like wallpaper, tall rainforest on one end and emerald sea on another. Underwater Diving: Palau Payar Island and Geo Park is a paradise for snorkelers and divers. Since childhood I wanted to explore the world under water, didn’t know it was just so easy. I do not know swimming, have never done it before, but the Introductory Dive package helped me do it. After a 15 minute training on breathing and communication under water, we were set with gears, cylinder and fins to take the first dip in the ocean. A master diver accompanied me in the dive, holding my hand and guiding me with directions. The unusual rock formations, variety of marine life, soft corals, brightly colored fishes and the sea bed, yes; he took me to the sea bed and indicated me to sit. In those 30 minutes under the sea, I had the best time of my life. The Pregnant Maiden Island is a gorgeous island which resembles a sleeping pregnant lady. This island can be reached by a speed boat, which is readily available with tour operators. The middle of this island has a fresh water lake which is green in color surrounded by mountains from all sides. 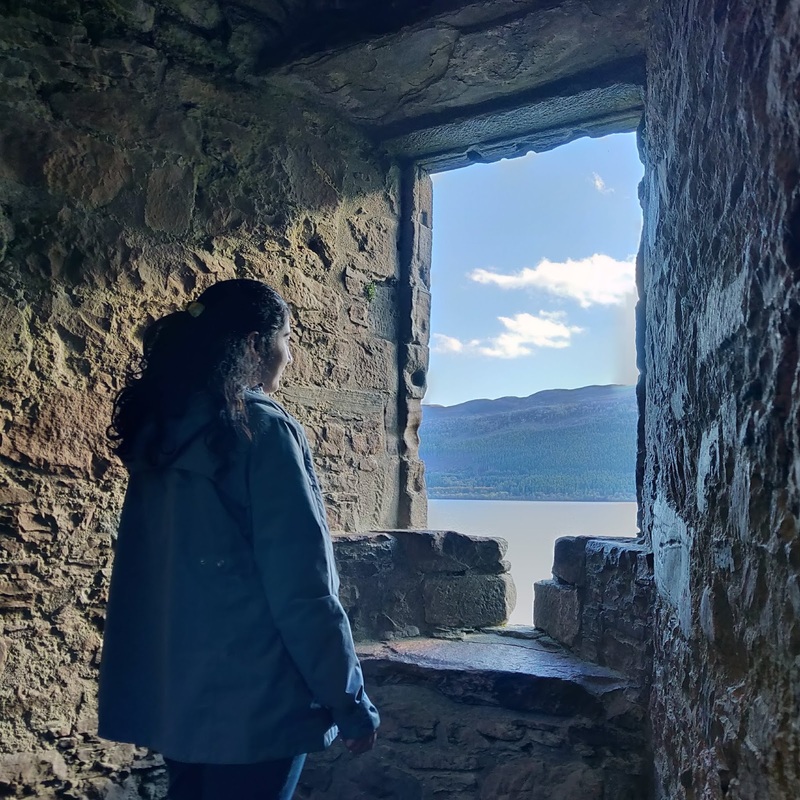 A folk tale surrounds this island too. Eagle Square is a manmade attraction that marks the entry to Langkawi for ferry drivers. A large sculpture of an eagle with open wings is a must photography spot. The island of Langkawi has something for everyone, whether you are looking for folklore, natural beauty, tranquility or a budget holiday, you would love it. For me, it was worth every penny. Enjoyed reading a nice detailed description of your trip. The legend around the giants was new thing to me. Thanks. trip outside India to a shoreline destination in Asia.Considering different choices, for example, Mauritius, Seychelles islands, Maldives, Thailand and Malaysia, picked Langkawi in Malaysia as it was inviting on our pocket and not very far.Different travel specialists encompassed us with their travel bundles, day visits and gave us free maps of the famous traveler spots.In case you're searching for long visits in Kerala picking kochi taxi service is that the best decision, similar to taxi administration.Gathered a neighborhood sim-card from one of the counters on the airplane terminal to stay in contact with our family back home. voyage west from the Penance shoreline,achieved a more disconnected and quiet shoreline.The sand is practically white with the boundless span of the Andaman Sea and a couple of more islands out of sight.It would appear that wallpaper, tall rain forest toward one side and emerald ocean on another. Fun. Freedom. Fulfillment. Since 2005, WorldVentures has embodied them all as the leading international direct seller of vacation club memberships. The Biere Street,, an Ideal Office Gathering !! !